I finished putting together a General Guitar Gadgets MBB kit over the holidays. I had ordered a case from Pedal Parts Plus but sense it hasn’t shown up in weeks, I used the original case for one of my GGG tube screamers. The wiring is really sloppy on this one. I’ll definitely clean that up when I move it to the permenant case. Anyway, the pedal sounds great and I couldn’t be any happier with it. I started building a BYOC Chorus back in November, and when I was finished, it didn’t work. I spent a lot of time going over the all the solder joints and checking the components w/ my multi-meter. I couldn’t track down the problem. A good buddy of mine, who actually knows what he’s doing, spent some time w/ me a couple weeks ago combing over the circuit. It turns out that one run to the depth pot had come loose and the trim pot was turned all the way down. 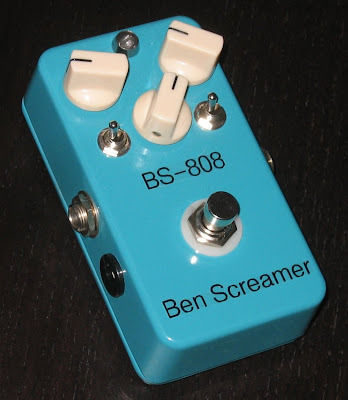 Now that it functions, this pedal sounds pretty good. It’s a worthy replacement to my old T.C. Electronics pedal that I lugged around for 11 years and never used. I did such a bad job painting this kit the first go-around that I felt compelled to re-do it. The LED is white and pulses to match the rate knob. I also added a switch to change from chorus to vibrato mode; which sounds terrible – but it was available so I has to install it. I was so pleased w/ my BS-9 that it really wanted another one with more of a vintage vibe. When the kit went on sale, I couldn’t resist. I first built this to the original 808 specs, but it didn’t sound very good. I then added the AMZ mods and the OPA3134 opp amp and now I like it quite a lot. I also doubled up on the symmetric clipping; There are 4x 1N914 diodes like my Barber LTD. It definitely gets that “Wayne Krantz” sound. I don’t think I’m 100% finished. 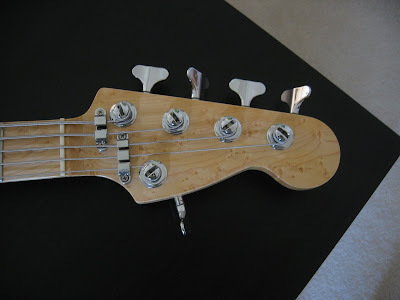 The bass boost is either not enough bass or too much bass – so I still need to play w/ the CAPs I’m switching between. This pedal also has a little bit too much in the mids for my taste, but it still sounds great and I really enjoy using it. Since I don’t care much for the LED clippers I’m going to be experimenting w/ MOSFETs in the near future. More to come. It’s pretty much finished. I had some problems w/ the pickup wiring, and had to take it to a local tech to fix. It turns out that one of my grounds was bad. For some reason the potentiometers from Warmoth are very difficult to get solder to adhere to. I got these great string guides from Hip Shot. They cost way too much money for what they are, but…….. they’re functional and let’s face it, they look cool too. I’ve had my Anderson Hollow Drop Top since 2002 and I’ve never removed the pickguard. I was overwhelmed with curiosity the other day while changing my strings so I carefully unscrewed it. You can see in the picture that the screws were laid out so they could be replaced in their original holes. How’s that for OCD?! I did not expect an H-S-H route, but it makes since that it’s cut that way. Lately, I’ve been getting the itch to do some more home recordings, and I always feel a little guilty borrowing friends’ basses. 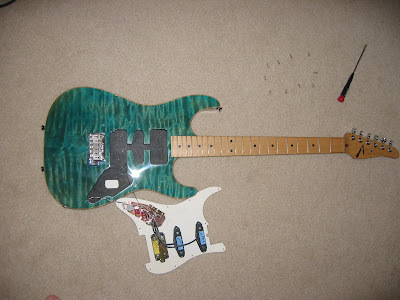 I’ve been so happy w/ my Warmoth Tele that I decided to build another one. Like all the gear I own this will end up being somewhat unconventional. 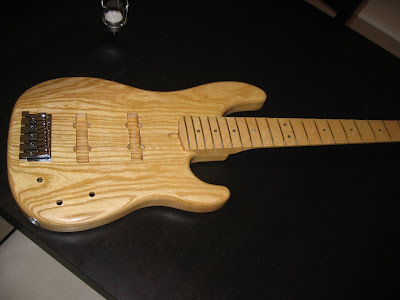 It’s a P bass body that will have J bass electronics. 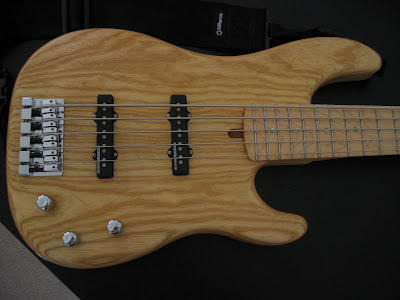 It’s also going to have a maple fingerboard (because I’m obsessed with that sound). I’m pretty excited about the new project. ….more posts to come. 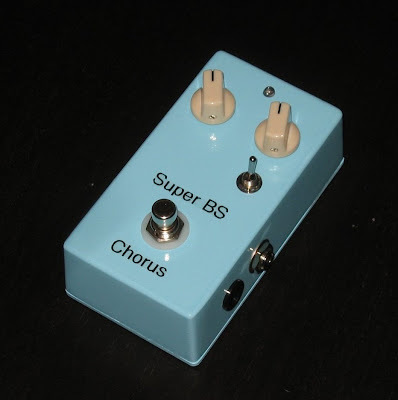 I finished my first DIY pedal and I’m pretty happy w/ how it turned out. I received my ITS8 kit promptly in the mail and spent a a good part of Saturday putting it together. This video was a great refresher for soldering. I spent the most time trying to get the wiring nice and neat. It’s not perfect, but I think it’s pretty good for my first build. I used the pedal at church on Sunday and it’s sounds awesome. I’m huge fan of DIY (do it yourself) projects. I don’t necessarily have the best track record for completing and sticking with them (like the radiant barrier in my attic), but I still enjoy getting my hands dirty on all types of DIY projects. 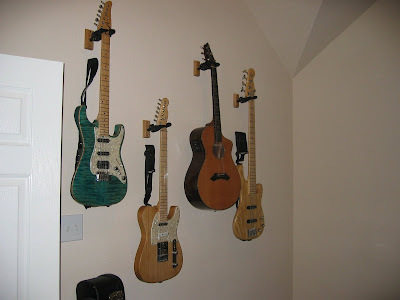 One successful endeavour was my Warmoth Tele which I put together and love playing it. Anyway, a couple weeks ago i stumbled across a web site www.buildyourownclone.com and was fascinated by what they sell. They have all kinds of DIY pedal kits that are clones of famous vintage pedals. They use top notch parts, have great, detailed instructions, and offer a lot of the popular “mods” for these pedals. To be honest I was really sold by the mods and the price. They also have an excellent forum w/ tons of great info. The kit was $30 bucks cheaper ($74 shipped).